E15 Initiative | As Trump ditches the TPP, what’s next for the world’s biggest trade deal? E15 Initiative | As Trump ditches the TPP, what's next for the world’s biggest trade deal? It was set to be the biggest regional trade deal in history. But now, hopes of ratifying the Trans-Pacific Partnership (TPP) are dashed. On 21 November, President-elect Donald Trump declared that he would make good on his promise to pull the United States out of the agreement when he takes office in January 2017. So what next for the TPP, the signature trade initiative advanced by President Barack Obama and painstakingly pieced together in formal negotiations over the past seven years? The deal would have launched a new epoch for world trade, at least on a regional basis. Covering everything from environmental protections to intellectual property, milk and sugar, it would have slashed trade barriers between some of America and Asia’s fastest-growing economies, and effectively turned a huge section of the world – as much as 40% of the global economy – into a single market. But for US presidential hopefuls, and in particular for Donald Trump, the deal represented “a potential disaster” and was billed as a threat to American jobs. Many of the 12 Trans-Pacific partners are yet to ratify the deal secured in October last year, but following Trump’s announcement it looks unlikely to go ahead. What exactly is the TPP? Another thing the TPP had going for it was the way it aimed to make regulatory issues more coherent and to raise standards with respect to the environment and labour. It offered a great opportunity to further align trade with inclusive growth agendas and the Sustainable Development Goals. The deal created groundbreaking new regulation on other 21st-century issues, such as cross-border data flows and state-owned enterprises, which now remain deregulated at the international level. So why is the deal so controversial? It’s not just the TPP that’s unpopular: there’s Brexit, the current scrutiny of the North American Free Trade Agreement (NAFTA) and other stalled negotiations, such as the Transatlantic Trade and Investment Partnership (TTIP) between the US and Europe. These have long been viewed with suspicion by unions, workers’ groups and environmental advocates – all of whom believe international trade empties their job markets and damages the environment, while filling the pockets of large global corporations. And no one – whether politicians, negotiators or free traders – has managed to explain to the broader public why these groups may be wrong. Even members of Obama’s own party are against the deal. Hillary Clinton wrote in her book Hard Choices that it would give businesses “the power to sue foreign governments to weaken their environmental and public health rules.” Bernie Sanders said the TPP allows multinationals to “rig the system to pad their profits at our expense.” Even traditionally free-trade advocates among the Republican Party are unsupportive. Who are the winners and losers if it fails? Not only is this because the demise of TPP and failure of an Obama-Clinton “pivot to Asia” removes a major new trade initiative – complete with heavy geopolitical ramifications – from Beijing’s backyard; but also because China now has free reign to lead an alternative regional integration pact, as already signalled by President Xi Jinping at the APEC summit in Lima this month, when he referred to the Free Trade Area of the Asia Pacific (FTAAP) negotiations. This could be the next big trade game in town. China and the 10 member countries of the ASEAN economic bloc are also leading efforts to secure a Regional Comprehensive Economic Partnership (RCEP) that includes Japan, India, South Korea, Australia and New Zealand. Unlike the TPP, the Regional Comprehensive partnership will likely see the light of day next year. The deal is expected to include lower standards than the TPP, but this may now be a case of not letting the perfect be the enemy of good. At the same time, countries without a pre-existing trade deal with the US – such as Vietnam and New Zealand – will lose access to the world’s major market. But businesses and service providers in the US (not to mention the rest of the TPP area) will also miss out. Just think of all the economies of scale and links to global value chains that could have been created. Can the TPP still go forward in some capacity? It’s extremely unlikely Trump will let the United States stay entangled with the TPP in the short to medium term following the unravelling of Trump’s policy plans for his first 100 days in office. And with the US out of the picture, other partners are sending conflicting messages on the deal’s feasibility. The agreement “has no meaning” without the US, says Japanese Prime Minister Shinzo Abe. “What it comes down to is … the Americans, I think, need to have time to weigh up the pros and cons,” says Australia Trade Minister Steve Ciobo, in a more conciliatory statement. And what about the World Trade Organization? After the US leaves the TPP, it’s not clear what the impact will be on the multilateral trading system. There’s a suggestion that key advances now lost in the TPP could eventually be brought back to the WTO table, reigniting momentum in Geneva, where the negotiations take place. But others believe – and with good reason – that plurilateral and multilateral trade talks will slide into irrelevance. They think trade supporters should focus on maintaining the current rule book and fighting protectionism. 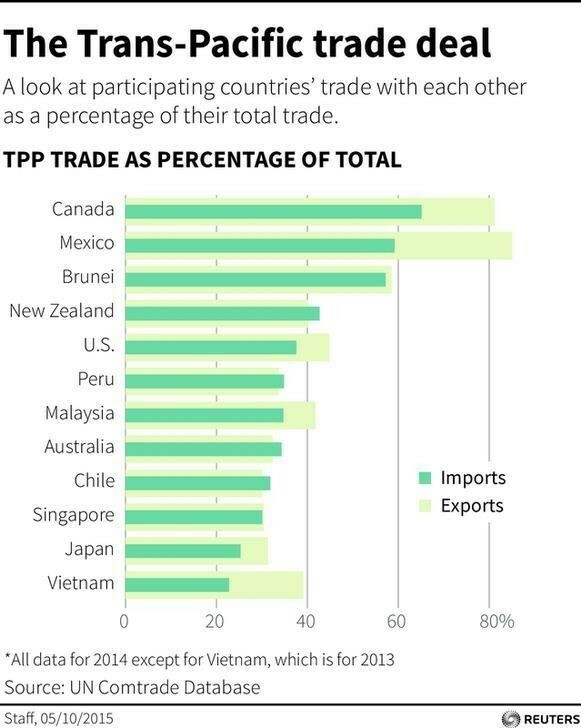 Finally, the TPP was America’s best chance of leading in the Pacific. Not only commercially but geopolitically. It looks like the die is cast. Now, it remains to be seen how the Trump administration – along with other Pacific players, such as China and Russia – reformulate the equation in such a crucial region for commerce, and beyond. This is an adapted and updated version of a piece that appeared in the World Economic Forum’s Agenda blog. Cristian Rodriguez Chiffelle is Group Manager of the E15 Task Force on Investment Policy and Expert Group on Competition Policy. He is Lead, Trade & Investment Policy at the World Economic Forum.